I am an American who enjoys some of the films that have been made from Christie's stories. 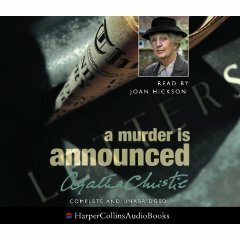 One of my favorites is A Murder Is Announced starring Joan Hickson as Miss Marple, and I watch that film often on VHS. There are two bits of dialogue in the film that are not comprehensible to me, and I am wondering if a British person who owns a copy of the film would be willing to help me with those lines. I think a British person would be more likely to understand the speech than an American would. The first is during Inspector Craddock's second interview with Myrna Harris. Myrna says "My mum said I would be an accessory before the fact." Craddock asks "Do you know what that means?" and Myrna responds with a short, two-syllable utterance that I cannot understand. Craddock then says, "I'm sure your mother is mistaken." The second occurs about an hour and fifteen minutes into the film. Mrs. Harmon and Miss Marple have just had tea at Little Paddocks and are walking back to the vicarage. Miss Marple says, "Tomorrow I shall explore your village," and Mrs. Harmon says, "It's very small. It won't take long." Then Miss Marple says "Oh, there are more things in Chipping Cleghorn..." and finishes her sentence with several words that I do not understand. Then Mrs. Harmon says something that is also incomprensible to me. That ends the conversation; the two ladies pass through an old archway, and the scene changes. I would appreciate any help anyone can give me on this subject.